The Mauritanian people emigrated from Mauritius, officially the Islamic Republic of Mauritania, a country in the Maghreb region of western North Africa. Four major ethnic groups reside in Mauritius including the White Moors, Black Moors, Black Africans, and the Haratine. (1) The White Moors, a lighter-skinned Berber people who speak Arabic and have traditionally owned slaves. Most men wear light blue shirts called boubous, which have ornate designs on the chest. White Moors are the power class in Mauritania and control more wealth than any other group. Some, however, live in poverty. It's not uncommon to find a White Moor living in a tent only slightly larger than that of his or her slaves. (2) Black Moors, a darker-skinned people who historically have been enslaved by the White Moors. Originally from sub-Saharan Africa, the Black Moors have taken on many aspects of the Arab culture of their masters. They speak Hassaniya, an Arabic dialect. (3) Black Africans, or Afro-Mauritanians, a darker-skinned people who constitute several people groups, including the Pulaar, Soninke and Wolof. These groups also are found in Senegal, which shares Mauritania‘s southern border. They look similar to Black Moors, but never were enslaved and are quite different in terms of culture and language. (3) The Haratine, which literally means "freed slaves," but it can be used to describe people who are in slavery or who belong to the former slave class of Black Moors. Many Haratine people exist somewhere on the spectrum between slavery and freedom and are the target of class- and race-based discrimination. Pray God will reveal via dreams and messengers of the Gospel that Jesus Christ is the free gift of God's grace and the one and only Savior for all mankind. 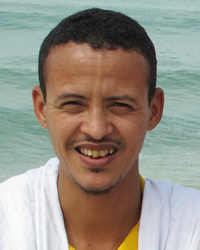 Pray Christians will intentionally become friends and share Christ both in word and deed with the Mauritanian people.